Ebay the last week or so has had listed and sold at auction some very desirable western soda bottles. 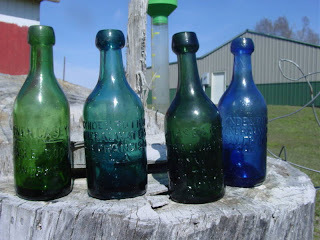 Yep, were talking soda bottles on the bitters site - but if you look under the Western Bitters News banner it reads; "Dedicated to the advancement of the antique bottle collecting hobby" and anything associated with our hobby is fair game in my book. A Golden Gate soda in “deep rich emerald green’ without any described problems reached $166 when the hammer fell. C&K Eagle Soda Works in a cobalt blue color fetched $113 when all was said and done. A brilliant lime green Owen Casey that was just listed already has three bids and is sitting at $395 with over nine days of auction left. The green three cities Chase soda with an iron pontil has 11 bids with over eight days of auction left and has already reached the $600 mark. Seems like the western soda’s are on fire right now and the prices they are realizing tend to confirm that assumption. On the western medicine scene a Pratt’s Abolition Oil with the backwards S has climbed to $37. The western Dr. J.J. McBride’s King of Pain and the Dr. Perry’s Last Chance Liniment, both started at a steep $199, are languishing as “Buy it Now” items. If you are looking for western soda’s or meds at auction...... bargains are few and far between at the present time.